Lambert & Rehbein were commissioned by Barron River Pty Ltd to undertake a Stage 1 and 2 site investigation of a former brickworks facility located in Mareeba, Queensland. The facility covered approximately 1 hectare and was heavily contaminated with fuel oil from four 20,000_L aboveground storage tanks. The Stage 1 and 2 site investigation determined the area of fuel oil contamination which was preceded by a remediation and validation program. A total of 2,000m3 of contaminated soil was excavated and subsequently placed in a containment cell located beneath a proposed road easement. The road easement was part of a future residential development that was planned for the site. 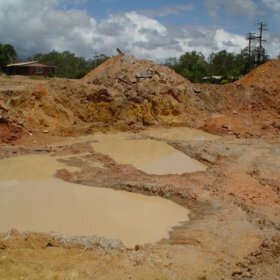 A Site Management Plan was subsequently approved by EPA for the management of contaminated soil beneath the road easement. The entire process was overseen by a Third Party Reviewer. Submission of a SMP and validation report to EPA to remove the site from the Environmental Management Register following the subdivision of the road easement (and containment cell) from the site.